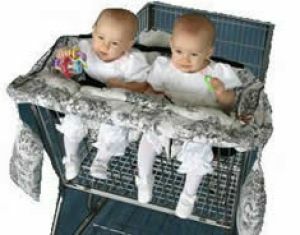 Twin Shopping Cart Cover Discounts Apply ! More than just a cool way to protect your baby and toddlers! The Buggy Bagg Twin Shopping Cart Cover is the extra pair of hands you need. Multi-purpose, serving as a diaper bag and a shopping cart seat liner. Padded seat with detachable pillows to allow your child to feel safe and secure. Multiple pockets and compartments to carry diaper items and mom/dad items, too. Crunchees inside to hold baby bottles, water and hook up toys! Equipped with inside and outside safety belts. Pillow is washable but must be detached before washing/drying. Currently available in black and white check patterned fabric.